The Villoresi family was well known in Milan. When Luigi was born in 1909 his father ran a company generating a electricity for the city, but it was his grandfather who was the most famous member of the family. He built a large canal taking water from the river Ticino near Milan's present-day Malpensa airport to irrigate that part of Lombardia. In recognition it was called Canale Villoresi and the name is still marked on maps of the area. Luigi's father, Gaetano and mother, Esther had five children but sadly the family was dogged by misfortune. Luigi's brother Emilio was killed testing an Alfa Romeo Alfetta at Monza, his sister Rosa died in a road accident and, perhaps more tragically still, another brother committed suicide. His last brother, Eugenio, died of cancer. Luigi's first motorsport endeavors were in local rallies in 1931 with a Lancia Lambda, but two years later he bought a Fiat Balilla, a model which opened the door to racing to many young Italians. It was in this car that he competed in the Mille Miglia, with his younger brother Emilio as passenger. They finished a creditable fifth in the hotly contested 1100cc sportscar class and from then on the Fiat was used in a number of events including the 1935 Coppa Ciano where he came third. That year he was so successful he became Champion of Italy in the 1100cc sportscar class, and the door to a career-long affair with Maserati was opened. For 1936 he bought one of the ex-factory 4CMs and immediately rocked the establishment by taking sixth place in the Voiturette race supporting the Monaco Grand Prix; his first race in the car! He shared the car with brother Emilio who proved to be a particularly quick driver. Quick enough, in fact, to be snapped up by Enzo Ferrari to drive the Scuderia Ferrari Alfa Romeos in the 1937 season. In the meantime, Luigi and the Scuderia Ambrosiana - which he had helped form with Count Giovannni Lurani - bought a 6CM Maserati (chassis 1541). By 1938 Villoresi was a full member of the Maserati team and had the opportunity to race the fabulous 8CTF (Eight Cylinder Testa Fissa - fixed head) of which only three were ever built. This had an in-line 3 litre, eight-cylinder engine with twin Roots superchargers, one driven off the crank and the other geared to the camshaft. It produced over 350bhp and was Maserati's answer to the Mercedes-Benz and Auto Union cars which were dominating Grand Prix racing at the time. Had it not been for the war, the car might have developed into a true race winner. As it was, one of them went to the States and, as the Boyle Special, won the Indy 500. World War Two having started, Villoresi still found time to race in the two major races held in 1940 on Italian soil, namely the XIV Gran Premio di Tripoli, where he finished 4th with a works 4CL (1564) and the Targa Florio, which he duly won. That was on 23rd May 1940, and the very last race of the period had been won by Villoresi. Almost six years later, in 1946, racing re-started (ignoring the September 1945 meetings at Bois de Boulogne), and Villoresi, now part of the Scuderia Milan, appeared on 22nd April 1946 at the Nice meeting, this time to remind his surviving colleagues that having been the last winner, he was ready to be the first winner of the new era. By the end of the day he won too, this time from rising star Raymond Sommer. 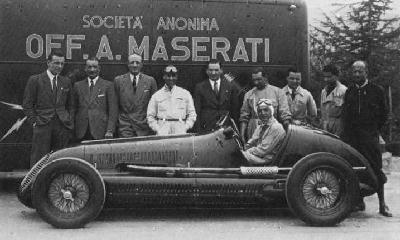 For 1947 he started to race together with his friend Alberto Ascari with the Scuderia Ambrosiana's Maserati 4CLs. It was an excellent year for Villoresi, who won races at Marseille, Nice, Strasbourg and Lausanne. In 1948 the situation remained much the same, with Ascari taking its first win at San Remo, but Villoresi, stronger than ever, drove to victory at Comminges, Albi, the British Grand Prix and the Penya Rhin meetings. In 1949 he had a big surprise: "I received a message from Enzo Ferrari saying he had sent a single-seater Ferrari to Brussels for me to race at the Brussels Grand Prix, and a sportscar to race in Luxembourg. I won both races and when I got back to Milan I had a telephone call from a journalist called Corrado Fillipini telling me that Enzo Ferrari wanted me to drive for him." This brought a dilemma for Villoresi; he had disliked Enzo Ferrari since the day of the accident which killed his brother Emilio at Monza: "On that day, June 28 1939, Enzo Ferrari put on a lunch, actually on the circuit, to show the new Alfetta. After lunch, they cleared the tables of the track and my brother 'Mimi' went out in the car. He did two laps with no problems and on the third lap he crashed into a tree and was killed. I asked Enzo if I could see the remains of the car but he refused, and when I asked him what had happened he told me he thought my brother had eaten too much at lunch and perhaps had an indigestion which had caused him to go off the road. Then I asked him about insurance and he told me there wasn't any, so I was very upset. After that, my brother's road car, an 8C Alfa Romeo 2300, disappeared and some time later Consalvo Sanesi, the Alfa Romeo test driver, told me that the steering had broken on the car. So I really did not like him. However, I decided to go and see what he had to say." When he arrived at Ferrari's house he was sent upstairs to the great man, who was ill in bed. He immediately made his feelings known: "I told him I knew he didn't like me and I didn't like him either, but let's talk. At the end of the conversation I left Modena not only with an agreement to join Ferrari but also with two other contracts which I was to pass to my friends Alberto Ascari and Nino Farina. All three contracts were exactly the same." His career was now into full stride, but despite his brilliance Villoresi was to have a number of accidents, the two most serious being in Geneva. One was in a Maserati when his mechanic put new tyres on the car and he shot off the road on the first corner (I Grand Prix des Nations, 21st July 1946). The second, when driving for Ferrari in 1950, was much more serious. "As soon as the race started the car was not running well and I could only get 10,000rpm when I should have been able to take 11,000. What I think had happened was that my mechanic Meazza in changing the plugs from soft to hard had missed two of them, and this was why the car was misfiring. I was down the field and someone up front blew his engine and spread oil over the road. I spun, hit the straw bales and overturned. Luckily I was thrown out of the car, but was lying in the middle of the read. Nino Farina actually saved my life as he saw me in time to swerve, but he too hit the oil, went off the road and crashed." Villoresi was taken to hospital in a coma, lost the top of one of his fingers but despite his injuries, 'Gigi' recovered in time for the 1951 Inter Europa Cup meeting at Monza, where Enzo Ferrari entered him in a Ferrari 340 Coupé. Not only did he win the race but he enjoyed it so much he asked Ferrari it he could race the Coupé in the Mille Miglia. Ferrari refused, saying he would have a Barchetta like Ascari, but Villoresi persisted. Eventually he was allowed to race the Coupé, and won the event. "Enzo Ferrari didn't understand that the Coupé was actually a better car for the Mille Miglia. The race was wet, but I felt comfortable and was very happy to win." At the end of 1953 Alberto Ascari (having scored back-to-back championships) and Villoresi went to Maranello to see Enzo Ferrari and apparently to discuss their contracts for 1954. But by that time, both of them had already signed with Gianni Lancia to race for the new Lancia Grand Prix team in 1954. As the Lancia D50s were not ready for most of the 1954 season, Villoresi was lent to his old friends at Maserati and drove 250Fs. At the Spanish GP the Lancia appeared but Villoresi retired from the race with failing brakes. During the 1955 season he drove solely for Lancia, scoring a fifth place at the Monaco Grand Prix, but for Ascari things took a nose dive when he famously ploughed his Lancia into the Monaco harbour. A few days later Alberto got killed at Monza during a test drive in Castellotti's new Ferrari sportscar. His civvies did nothing to protect him. 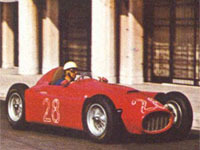 At the end at the season Gianni Lancia handed over his cars to Enzo Ferrari and the Lancia-Ferraris triumphed in the 1956 season, but without Villoresi. He returned to the Maserati fold and finished fifth in the Belgian GP in a Centro Sud 250F and sixth in the British GP in Luigi Piotti's 250F. It was therefore only fitting that he should end his Grand Prix career at the Italian GP of 1956 in a factory Maserati. Sadly, it retired. His racing days over, Villoresi lived quietly in Modena. But he remained a fine ambassador for Maserati and was always present on the company's stand at motor shows. Two years ago, on the 24th August 1997, after having successfully reached 88 years of age, Villoresi, the last of the Villoresis, died peacefully in the Santa Caterina nursing home in Modena, where he had spent the last years of his life. He was truly one of the great Italian racing drivers. Many years ago in a sunny and pleasant land there lived a wise old silver-haired wizard. He was renowned throughout the world for his skill and knowledge and for many years the wizard was the master of his world. The years passed and the wizard decided to take an apprentice upon whom he would bestow all his wordly knowledge. Under the tuition of the wizard the apprentice grew in stature and his glory outshone even that of his mentors. Many titles were bestowed upon him and for a long, long time he was the new master of the world. However, in a land to the north, plans were afoot that would change that. The people of the north were also wise but their wisdom lay in the art of metal-working and the fashioning of mighty machines that would crush their enemies with ease. To lead their assault they chose a man from a far-off land who was also possessed with a great gift and for many months he fought alone winning many great victories. Still the wise men of the north were not happy and they too found a willing apprentice to whom their champion could teach the ways of their world. Early skirmishes were inconclusive and so the two sides agreed to meet once more and wage war upon each other in a peaceful land by the sea. Here the truth would be learned once and for all and the mastery of the world would be decided. No, it's not Lord of the Rings. It's Monaco 1955 and the Mercedes-Benz steamroller has spent the last 18 months destroying the reputation of many a car builder. As the lead driver of the German team in 1954 Fangio had secured the championship with ease and was determined to repeat the feat once more. For 1955 he was to be aided by the young British star Stirling Moss. Alberto Ascari, fresh from two world titles at the helm of a Ferrari, was well aware that Enzo did not have the capabilities to challenge the Germans and had switched to the new Lancia team. Alongside him sat his mentor, and friend, Luigi Villoresi, whose racing experience was to be crucial if Lancia was to mount a series challenge to the German dominance. Villoresi had been racing, and winning, since the early 1930s when as a member of the Maserati team he had twice won the Italian championship. After a spell as a prisoner of war he returned to racing and soon set about winning races once more. In 1948 he switched to Ferrari where he found in Alberto Ascari a fine student and a worthy competitor. The two men became the greatest of friends and Luigi shared much of his knowledge of racecraft with the young Ascari. During the years 1950-51 the pair spent many a race chasing the dominant Alfa Romeo team, picking up the odd victory along the way. During the 1952-53 seasons Luigi took a back seat as his student rose to the challenge presented by the Formula 2 rules. Ascari utterly dominated the opposition in his Ferrari 500 winning back-to-back championships. Eventually the Formula 2 period came to an end, the news of the imminent arrival of Mercedes put the wind up Ascari and he opted to join the new Lancia team. Luigi followed him. The name Lancia was well known in motor racing circles as the company's founder Vincenzo had been a capable driver himself during the early days of racing. By 1950, however, Vincenzo was dead and control of the company had passed to his son Gianni. Crucial to the team was the presence of perhaps the greatest designer of the day, Vittorio Jano. Jano was, of course, famous as the father of the ultra-successful pre-war Alfa Romeos with which Nuvolari had thrilled his fans while thwarting Hitler. He had already built a series of excellent sports cars for the company and so the step up to the premier category did not seem to present too great a challenge. Work began in late 1953 and by end of the 1954 season Lancia took to the field with their machines. Named the D50 the car had a claimed 260bhp and with a weight of just 620kg it had an excellent power-weight ratio suggesting that it might just give Mercedes a run for their money. Their first appearance took place in Spain and although Ascari bagged pole the cars suffered from a few teething problems and were forced into retirement. For the 1955 season Lancia decided to bolster their corner a little and so recruited Eugenio Castellotti, something of a rising star in his native country. The season did not begin well with all three cars retiring from the first race in Argentina. Three minor races saw better results but the picture was no clearer as Mercedes chose to ignore those events. Then came Monaco and to help their cause Lancia recruited the veteran Louis Chiron, one of the men behind the inception of the famous Monte Carlo race. In practice Ascari managed to split the German cars and started second having registered a time equal to Fangio. When the flag fell the German cars took the lead and Ascari had to settle for third. At the front Fangio looked to have the race in the bag but just before half-distance he retired with gearbox and engine problems. With just 20 laps remaining Moss also suffered a rare engine failure. The Italians in the crowd were overjoyed but before Ascari could pass the ailing Mercedes he missed the chicane, crashed through the straw-bale barriers and landed in the harbour. Many thought the worse but Ascari broke free of the car and swam ashore with nothing more than a broken nose to remind him of the experience. On the track Maurice Trintignant, driving for Ferrari, took the flag just ahead of Castellotti. Third place was a shared effort from Jean Behra and Cesare Perdisa. The other Lancias finished fifth and sixth with Villoresi leading Chiron home. It was the only championship race of the season where Mercedes did not secure a podium position. It was also the first point scoring finish for Lancia. Just four days after the race Ascari was dead. He arrived at Monza to watch Castellotti testing his new Ferrari 750 sports car. Alberto asked for a drive and set off for a run in his street clothes. He didn't come back. The cause of his death was never determined and theories abounded for a long time. The most likely explanation was a tyre failure. Some people regard it as a bizarre coincidence that his father Antonio, the great Alfa Romeo star of the 1920s, was also killed on the twenty-sixth day of the month when he crashed in the French Grand Prix at Montlhéry. In fact, something of a sub-culture developed attempting to attach deeper significance to these two unrelated facts. As for Villoresi the loss of his great friend was a hard blow to take and his career went into steep decline. By the end of the following season, having lost his works drive, and finding his offers limited to a number of private outfits, Villoresi withdrew from racing. A broken leg from a sports car crash at Castelfusano didn't help matters and led to his family pestering him to retire. He deferred to their wishes and apart from a winning drive for Lancia in the 1958 Acropolis Rally his racing career was over. Lancia too decided that perhaps enough was enough. The team entered three cars for Spa but in the end only Castellotti raced in what amounted to a private effort. The situation was hardly helped by the financial pressures that running a race team had placed on the company. The Lancia family elected to end their involvement and the company was sold to a consortium of industrialists. Never one to miss a chance, Enzo Ferrari announced that he could no longer underwrite his racing operation and claimed that his quest to uphold the honour of Italy would leave him personally bankrupt. The plan worked a treat and, led by Fiat, Italian industry stepped in to help Ferrari. Fiat provided a five-year plan worth a total of £140,000 and the new owners of Lancia made a present of six of the seven D50s in existence, all the spares, transporters and the services of Vittorio Jano. Two D50s were entered for the Italian Grand Prix but tyre problems meant that they didn't run. The final outing of the D50s in their original form came at Oulton Park later in the year where Mike Hawthorn scored a fine second place behind Moss in a works Maserati. For 1956 the cars underwent some radical modifications and were henceforth known as Lancia-Ferrari 801s. The D50 that remained ended up in the hands of Gianni Lancia himself and is still occassionally seen at historic festivals.